St. Stephen’s Cathedral Vienna (Stephansdom) has a total of 4 towers. The high church tower is the south tower with a height of 136 meters. The north tower was never finished, it is therefore only about 58 meters high. The two smaller towers are called Heidetürme (left and right Heideturm, 66 and 65 metres high). Climbing the South Tower is exhausting. You go up 343 steps, there is no elevator. 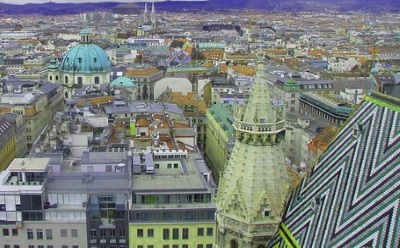 But you will be rewarded with a magnificent view over Vienna. Among the inhabitants of Vienna, the south tower is called „Steffl“. Because of its great height, the Steffl is regarded as the actual tower of St. Stephen’s Cathedral (also more rarely called Stephan’s Church). For many Vienna tourists, climbing the steeple is one of the highlights of their trip to the great city of Austria. The ride to the north tower of the St. Stephen’s Cathedral by lift is easy. This church tower is also called Adlerturm (Eagle Tower, Adler Tower). The view from the north tower is also good, but from the much higher north tower the panorama is much better in all directions. The interesting thing about the North Tower is the biggest church bell of Austria. The bell is called „Pummerin“, weighs about 20 tons and has a diameter of 3,16 meters. The lift to the north tower (Adlerturm) is therefore called „Aufzug zur Pummerin“. Aufzug is the German word for lift. The ascent of the Südturm (South Tower, Steffl): Adults pay 5 Euro entrance fee, children (6 to 14 years) 1,50 Euro. Important: Combi-Ticket Stephansdom: Beside the two towers you also pay for the famous catacombs, for the cathedral treasure (see cathedral treasure Vienna) and for the interior of the Stephanskirche entrance fee. There is a cheap combination ticket including audio guide and guided tour through the catacombs and much more. This is considerably cheaper than single tickets for all sights in St. Stephen’s Cathedral Vienna. The ticket is available on the Internet at the well-known Getyourguide website: >>>>>More info and online-tickets. The tower ascent on foot to the Steffl (north tower) is possible every day from 9 am to 5:30 pm. The opening hours of the North Tower (Adlerturm) are similar: Daily from 9:30 to 17:30. 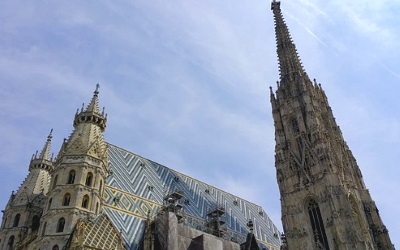 On Sunday morning, however, one cannot visit the interior of the large St. Stephen’s Cathedral Vienna because of the divine service, this is similar on some holidays. Also the visit during the week is better, because less is going on. St. Stephen’s Cathedral is well visited in summer and on weekends and there are crowds, especially on the two towers. Those who can should come during the week, especially in summer.